Greetings and Shalom, my name is Steven Ericksen. I've designed this web site to be an online messianic ministry. I'm the Shepherd (Pastor) of this online ministry. Please stay and browse around the site, I will be adding content regularly so please return often. I follow a literal interpretation of scripture unless context clearly requires otherwise. I regard the oral tradition as valuable but not authoritative. So, for instance, years begin in springtime, and months begin with the new moon. Some translations use the term, "Appointed Times," which I feel is a good way to remember that Yahweh made these appointments. Please feel free to visit my blog. I will be updating it with topics that you can comment on. Please click on this link to be taken there. I really would appriciate your offerings. Please make checks out to Steven Ericksen. Thank you. If you would like to make an offering online please click the button below. Encouraging Words, a book designed to give you the reader encouragement in times of despair and gloom. I wrote and illustrated this book to be an encouragement to you so that when you are encouraged you will be more able to encourage others. 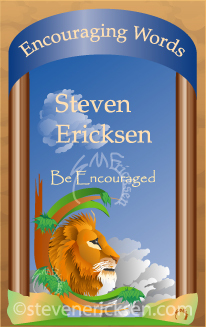 The book is a collection of eight of my animal illustrations with my own encouragement passages. Please click on the cover image below to be taken to my book page on amazon.com. Once there you can purchase a copy for yourself. You can download a free app before you make the purchase at this link. If you have a Kindle or other devises that have an eBook reader than you can go directly to the link below. May you be encouraged always! !